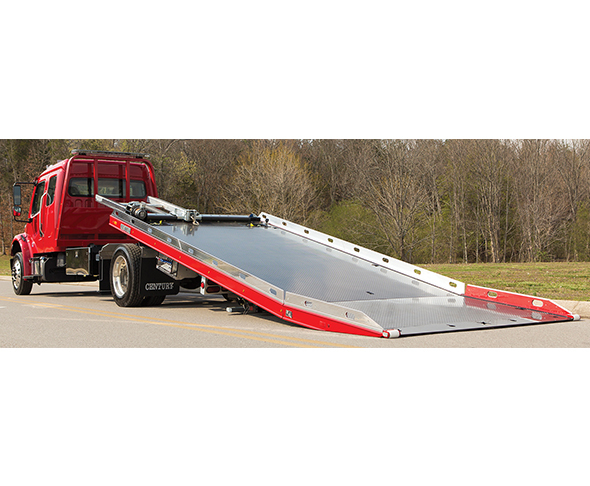 Century®, Vulcan®, and Chevron™ offer a complete line of steel and aluminum car carriers. While conventional series are available, the popular LCG™ (Low Center of Gravity) models provide a 5” to 7” lower deck height along with a lower load angle. For those extra hard-to-load low-clearance autos, we offer many different tail options like the Gen2 LoadRite™ with its unique drop-deck design that lowers the angle 3 more degrees, or the SST™ (Solid Sloped Tail) that lowers the load angle an additional 3-1/2 degrees, to the most popular Right Approach®/ Extreme Angle® tail designs that provide an incredible 6-degree reduction in load angle. Call 800-292-0330 or visit MillerInd.com.